Thanks to an angel on the blog staff at the ISO C++ web site, my last C++ post garnered quite a few hits that were sourced from that site. Thus, I’m following it up with another post based on the content of Bjarne Stroustrup’s brilliant and intimate book, “The Design And Evolution Of C++“. “Complex systems will evolve from simple systems much more rapidly if there are stable intermediate forms than if there are not.” — Simon, H. 1982. The Sciences of the Artificial. “A complex system that works is invariably found to have evolved from a simple system that worked… A complex system designed from scratch never works and cannot be patched up to make it work. You have to start over, beginning with a working simple system.” — Gall, J. 1986. Systemantics: How Systems Really Work and How They Fail. If you consider yourself a dedicated C++ programmer who has never read D&E and my latest 2 posts haven’t convinced you to buy the book, then, well, you might not be a dedicated C++ programmer. Gall’s book is a mandatory read. Just made a quick pass through your paper. Nice job. Is that the 3rd edition? 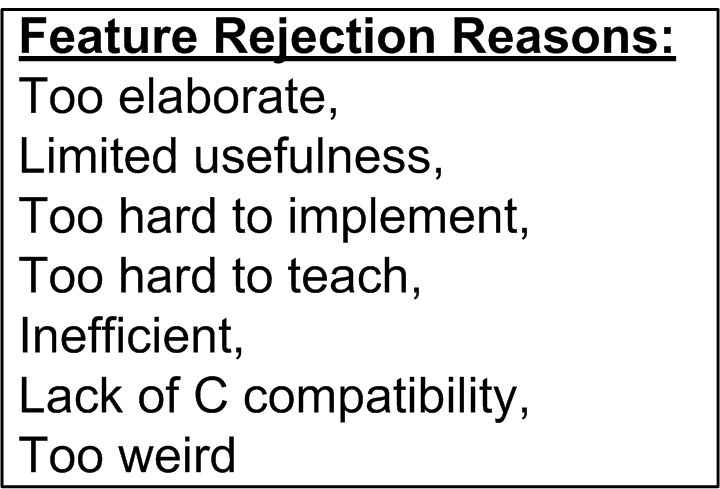 D&E … the best C++ book. This is wrong in so many ways. A is for APL, B is for Basic (oversimplified introductory language because rigorous logical expression is too much to ask of beginners), C is for C because it came after B. C is like PHP, a bad copy. 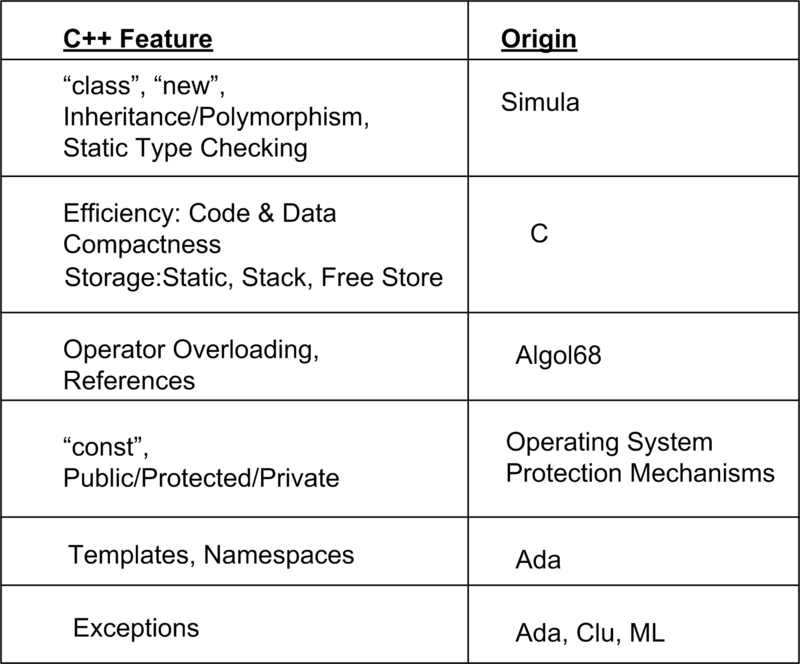 C++ is two steps back after two steps back after decades of lost progress and forgotten advanced programming language theory that was already a reality that has taken language development. We teach people functions when we should be teaching them APL as a way of expressing complex logical operations as executable code. The nirvana of stateless code are functional expressions written in languages like J where the values are implied and don’t need to be explicitly declared even when referenced directly. It’s not “wrong”. 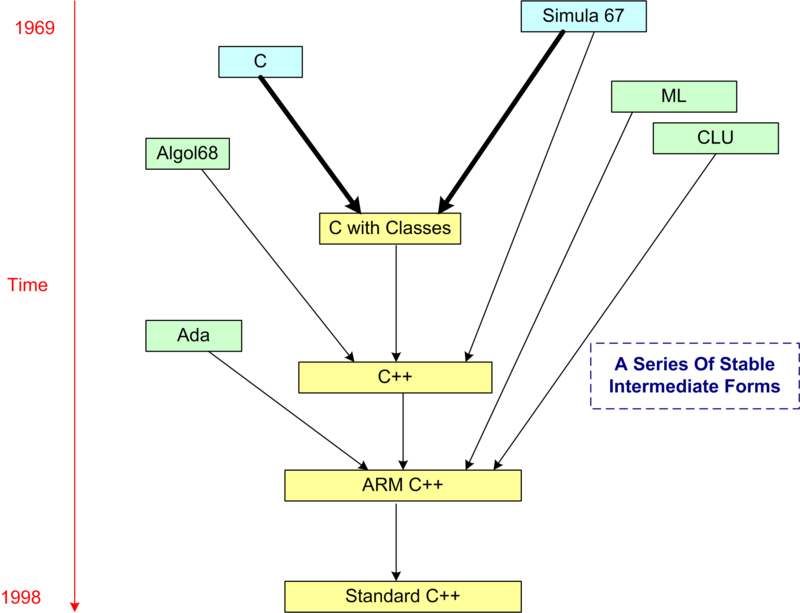 The figure simply shows the progressive growth of C++ and which of its features came from which other languages. I’m a bit of a zealot and have trouble communicating my ideas clearly.